Could it be the Snow? First I want to follow-up on a couple things from previous posts. 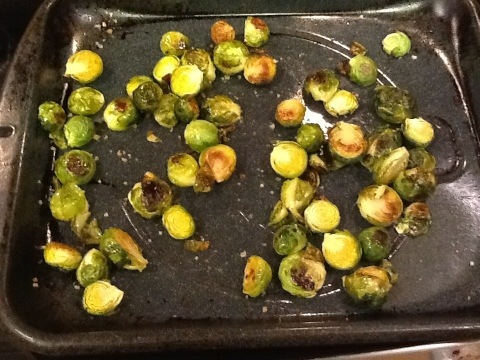 I mentioned roasted Brussels sprouts but gave very little guidance. 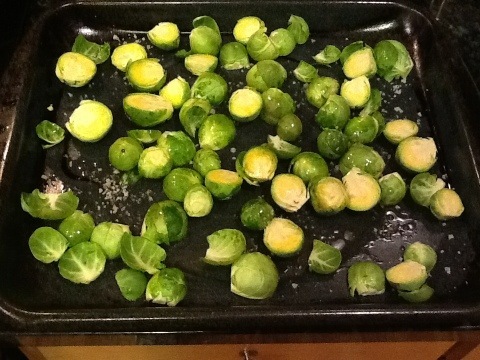 Cut the bottoms off the sprouts and cut the large ones in half, mix in olive oil in a roasting pan and top with sea salt. This is how they look when they are done, or you could roast them a little longer. I was hungry and the rest of the meal was ready. So this is not a low-carb or diabetic-friendly dessert, but with 7g of fiber and all the nutritious ingredients, it’s still a great alternative to conventional desserts. For instructions see my previous blog post. Please use this recipe as a guideline and incorporate whatever you have handy to throw into a frittata. Looking forward to having this for breakfast again tomorrow! Best part: it was delicious, and I don’t have to share it! Comments: My husband sometimes gets frustrated with me because I can’t duplicate what I’ve made in the past, so this is a good idea. Comments: unable to perform due to back pain. However, I did notice that I had less back pain today. A cold front came through, and it even snowed a little this afternoon. Not sure if the change in weather is what made the difference. I’m hoping it will be well enough tomorrow for me to do some sort of exercise. Comments: this was a “make a to-do list” challenge. I attended a class all day, so it wasn’t something meaningful for today. I find to-do lists frustrating. In my work I am constantly getting pulled away from my desk by a number of people. If I get a patient referral, I have to drop what I’m doing and go to the hospital. I may try a to-do list tomorrow for my day off. Struggles with Primal efforts: had to pack a lunch & snacks to take with me to the class, but it wasn’t a big deal. Benefits noticed from primal efforts: plenty of energy and mental focus during long and demanding class today. 5 Responses to Could it be the Snow? 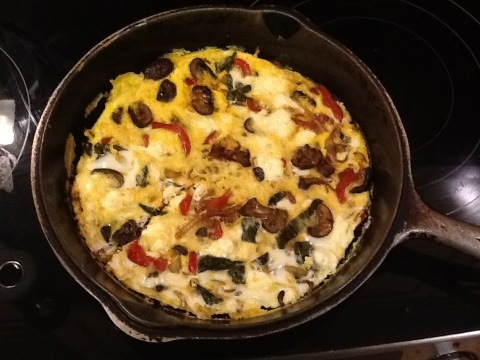 Frittata looks divine, love the reference to ala refrigerator gourmet, brings back memories of Alice. Can’t wait to try the dessert. Thanks, Mom! So did Alice originate the term? I’ve always liked it better than leftovers, which has an undeserved negative connotation. Jewel is excited for you & Dad to try it.